When it comes to homophobia, xenophobia, gynephobia and other forms of reactionary drama, my old home state Arizona has a knack for winning the spotlight. Arizona’s recently proposed religious license-to- discriminate, vetoed by governor Jan Brewer, is merely the latest in a long series of head-shakers. Now that it’s over, most of us would like to think we can turn our attention to our laundry. Or climate change. Or whatever. “Religious freedom” in this context, is not only the freedom to think and worship as one pleases. It is a get-out-of-jail-free card that also gives holders the right to impose their will on others and mooch off of taxpayers from a position of righteous privilege. If the “religious freedom” argument works, conservatives are betting that it will let them turn back the tide on gay rights, keep knowledge of evolutionary biology away from children and block access to family planning. They hope also to proselytize on the public dime using dollars targeted for education, aid, and national security—while leveraging nonprofit tax exemptions to maximize their real estate holdings and other investments. Anyone who cares about personal freedom or equality for women, queers, and secular Americans should be taking these aspirations seriously. Georgia, Ohio, Idaho, and Oregon all have bills under review that would legally secure the right of business owners to discriminate. In Georgia, the law would let a business to ignore state law that “directly or indirectly constrains, inhibits, curtails or denies” the owner’s religious beliefs. The Ohio and Idaho statutes protect people from civil litigation if they acted out of religious conviction. Legislation introduced in Oregon specifically targets gay and lesbian wedding services. Colorado, Kansas, Maine, Tennessee, and Utah have had to fend off similar legislation. As I said, the right to refuse service is just one of many “religious freedoms” that Christian conservatives are hoping to secure. For example, legislation under consideration in South Dakota protects defamatory speech against gay people. In Washington in February, publically funded healthcare systems administered by religious corporations won the right to discriminate in hiring. For healthcare workers, the ramifications are enormous because, thanks to mergers, Catholic corporations are the only significant healthcare employer in several counties. Freedom to discriminate means queer or secular doctors, nurses, allied health professionals and even some support staff have no equal right to work. Furthermore, Christian symbols and language let potential employees know they may not be welcome before they even apply. In the San Juan Islands, the only publically subsidized hospital opens job announcements like this: “At Peace Health we carry on the healing mission of Jesus Christ . . . we follow the ethical and religious directives for Catholic health care. . . . “ Catholic care systems have also argued that their workers should have no right to union representation, because being subject to the National Labor Relations Board would violate the religious autonomy of the Church. Nationally, Hobby Lobby, Conestoga Woods and others have taken up the cry of “religious freedom” in their effort to turn back Obamacare. Justification for this fight comes straight from the Bible, which teaches that “women will be saved through childbearing” (1 Timothy 2:15). As church leaders keep reminding us in vile terms, uppity women who delay or limit childbearing violate men’s rights and God’s plan. Religion advocates at the Becket Fund, together with conservative business owners, have taken this religious freedom fight to the Supreme Court where they will argue that a for-profit corporation has religious conscience rights (and by implication these rights trump both public health considerations and the individual conscience rights of employees). With the Supreme Court dominated by Catholics, “religious freedom” may carry the day. From the outside, some of the claims that Christian organizations have made in court seem crazy: A church should be able to make speculative real estate investments without paying tax on undeveloped property like other investors would. A publically licensed and tax-subsidized hospital should be able to turn away a hemorrhaging woman who needs miscarriage management. A parochial school should be able to obtain public education vouchers while blending biblical literalism into every class. An Evangelical nonprofit should be able to fire warehouse staff who disagree about theology while simultaneously funding their work with federal aid dollars. A missionary group that targets young children for conversion must be allowed to operate on public school grounds if any clubs are allowed. Astoundingly, these are the kinds of cases that have been won in recent years, some at the level of the Supreme Court. Small wonder then, that religious conservatives across the country think religious privilege is an entitlement, no matter who else might get hurt. 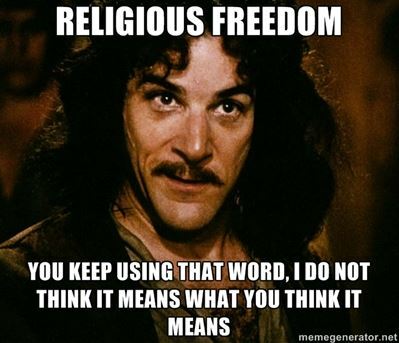 Small wonder they have seized on “religious freedom” as the legal trump card that they hope will put them above human rights law, employment law, and civic duty. Whether they can get away with it remains to be seen. Reactions to the Arizona fiasco suggest that conservative legislators there underestimated the backlash triggered by their transparent bigotry. The decisive arguments came from business leaders who threatened economic costs. But in the long run, the most significant consequence of Arizona’s over-reach may be the impact on young people, for whom the “religious freedom” mantra is now indelibly linked with homophobia. The truth is, evangelical Christians have already “lost” the culture wars. And it’s not because the “other side” won or because evangelicals have failed to protect our own religious liberties. Evangelicals lost the culture wars the moment they committed to fighting them, the moment they decided to stop washing feet and start waging war. And I fear that we’ve lost not only the culture wars, but also our Christian identity, when the “right to refuse” service has become a more sincerely-held and widely-known Christian belief than the impulse to give it. Gallery | This entry was posted in Christianity in the Public Square and tagged conscience clause, queer rights, religious freedom, war on women. Bookmark the permalink. An old one that I found, while deleting others way more recent that I’ll never get around to Celebrating and composing a cogent additive to. BRAVO V.T. as always. But where, HEY? Where are all the usual Comments, to this one?? (And was this before you moved AwayPoint? So do you still seen this??) Anyways. My-O-My, are there ever myriad ways in which most every God based religion requires you to abuse non-believers. Like taking away an individual’s chance to learn how the World actually works. Such as, to learn what Mother Nature requires of us in order to survive. Oh, and those tiresome questions “What’s the meaning of life?? What’s the purpose of life? ?” Please, folks! Give me- and the rest of us- a break!! Absolute Answer! To Survive and Go On Evolving. Any real questions out there? Good answer, Allan. I hope life is treating you well. Good article. If there is one thing this research demonstrates, it’s the truism I was made aware of in history classes a long time ago: the more things change, the more they stay the same.